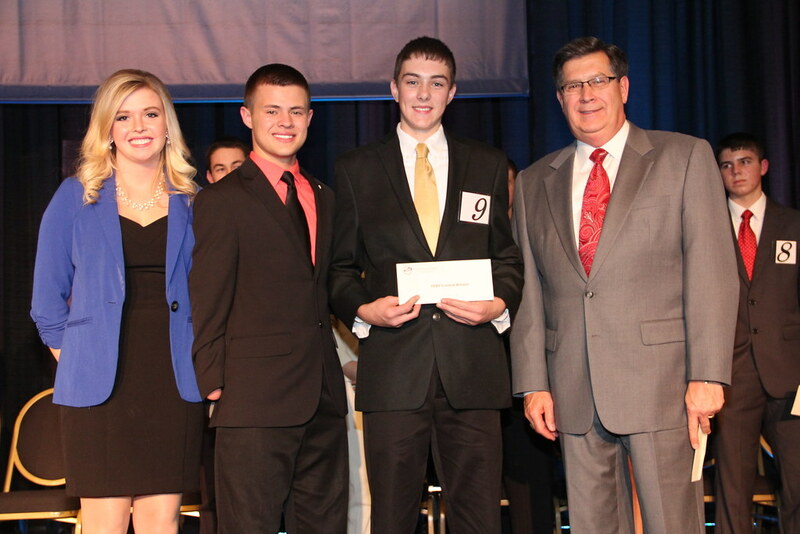 Louisville, KY (December 5, 2014) – Cody Lee Burke of Fleming County, and Lilly Robertson of Logan County were awarded top honors in the 2014 Outstanding Farm Bureau Youth contest. Both winners were recognized during the December 4 general session of Kentucky Farm Bureau’s (KFB) 95th annual meeting, held at the Galt House Hotel in Louisville. Cody Lee Burke (right center) received the 2014 Outstanding Farm Bureau Youth award from 2013 winners, Erica Rogers of Calloway County (left) and Justin Hobbs of Breckinridge County (left center), and David S. Beck, KFB Executive Vice President (right). Burke and Robertson were selected from 22 district finalists out of approximately 400 young people who competed in county and district contests over the past several months. Judges met with finalists for personal interviews during the annual meeting, awarding points for each contestant’s leadership record, conversational ability and scholastic achievement. KFB gave both Burke and Robertson a $2,000 college scholarship, an expense-paid trip to Washington, D.C., on the KFB Congressional Tour in February 2015, a luggage set and watch for winning the contest. Runners-up in the contest were Tanner Erlandson and MaKayla Campbell, both of Lincoln County. They each received a $200 cash award and digital camera from KFB. Congeniality awards, which were voted on by their fellow contestants, were won by Taylor Nash of Shelby County and Lilly Robertson of Logan County. KFB awarded both of them with $100 cash prizes for the honor. 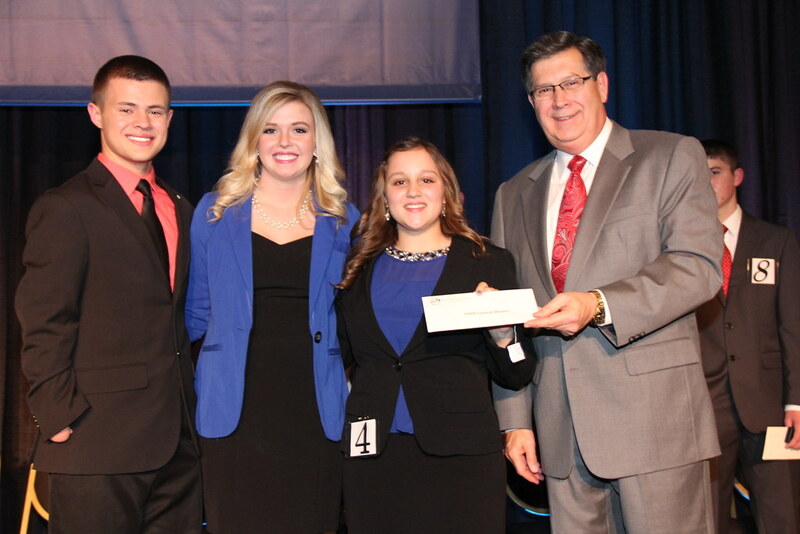 Lilly Robertson (right center) received the 2014 Outstanding Farm Bureau Youth award from 2013 winners, Justin Hobbs of Breckinridge County (left) and Erica Rogers of Calloway County (left center), and David S. Beck, KFB Executive Vice President (right). Allison Brockman, Adair County; McKenna Lewis, Anderson County; Rebecca Markham, Caldwell County; Luke Trapp, Campbell County; Rachel Drumm, Clark County; Breanna Cornett, Clay County; William Dubre, Cumberland County; Cody Burke, Fleming County; Jenna Harrod, Franklin County; Jordan Abell, Green County; Miranda Robinson, Greenup County; Blake Quiggins, Hart County; James Payne, Henderson County; Jonathan West, Knox County; Cayleigh Allen, LaRue County; MaKayla Campbell and Tanner Erlandson, Lincoln County; Lily Robertson, Logan County; Adam Cornette, Martin County; Caroline Smith and Wyatt Wood, McCracken County; and Taylor Nash, Shelby County.